Free Printable The Walking Dead Word Search Puzzle. Free Printable Word Search Puzzle of the favorite TV Series “The Walking Dead”. The Walking Dead word search that you can print and share with friends, fans, family, co-workers. Great activity for your next The Walking Dead party. Find Lucille, Rick, Michonne, Negan, Daryl, Alexandria, Wolves, Glenn, Rosita, Carol, Abraham, Jesus, Aaron, Walkers, Saviours, Terminus, The Kingdom, Ezekiel, Daryl, Sanctuary, Gareth, Shiva, Hilltop Colony and many more. 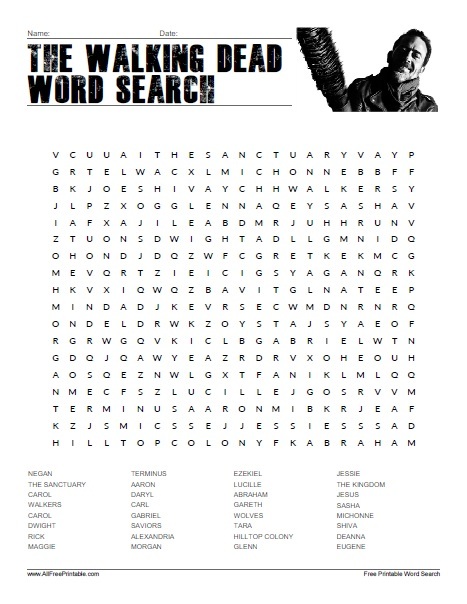 The word search includes the 32 random words from TWD Seasons and Answers on page 2. Click the link below to download or print the The Walking Dead Word Search Puzzle now in PDF format.